In a previous tutorial, we learned how to add multiple strokes around text in Photoshop simply by making multiple copies of our Type layer and adding a Stroke layer effect to each copy, with each stroke set to a different size. In this tutorial, we'll learn a more interesting way to create a similar multi-outline text effect, this time using the power of Photoshop's Smart Objects! Adobe first introduced Smart Objects back in Photoshop CS2, which means you'll need CS2 or higher to follow along. I'll be using Photoshop CS5 here, but any version from CS2 on up will do. Multiple text strokes using Smart Objects. Clicking on the Layer Effects icon. Choosing a light blue from the Color Picker. Increasing the stroke size to 21px. The first stroke appears around the text. I now want to add a second stroke around the initial stroke, but that becomes an interesting problem. By default, Photoshop only allows us to add one Stroke effect at a time to a layer. If I was to click again on the Layer Effects icon at the bottom of the Layers panel and again choose Stroke from the list, Photoshop would re-open the Layer Style dialog box set to the Stroke options, but all I'd be able to do is edit the options for the stroke I just added, changing its color, size, or any of the other options, but I couldn't add a second stroke. At least, I couldn't add a second stroke around the text itself. But what if we could somehow place the text inside a container, and then add a new stroke around the container? As it turns out, that's exactly what we can do using Photoshop's Smart Objects! A Smart Object is essentially a virtual container for the contents of a layer, and all we need to do is convert our Type layer into a Smart Object, at which point we can add a second stroke around the Smart Object! Clicking on the menu icon. Choosing another Stroke layer effect, this time for the Smart Object. Setting the new stroke to the same color as the text, and leaving its size set to 10px. 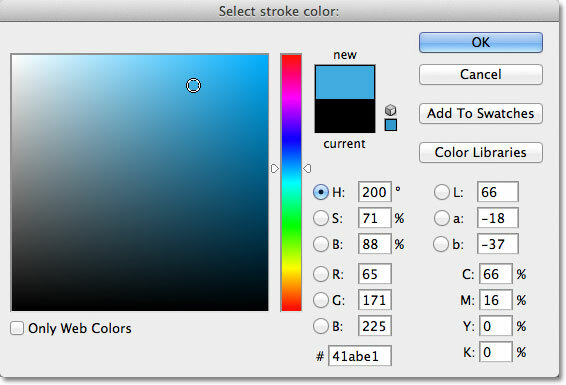 A second, darker blue stroke now appears around the initial stroke. Photoshop allows us to nest Smart Objects inside other Smart Objects, which means we can use this technique to add even more strokes if we like! All we need to do is repeat Steps 2 and 3. First convert the current Smart Object into a new Smart Object by clicking on the menu icon in the top right corner of the Layers panel and choosing Convert to Smart Object from the list. This will place the current Smart Object inside a new one. Then, add a stroke around the new Smart Object by clicking on the Layer Effects icon at the bottom of the Layers panel and choosing Stroke from the list. Adding a third stroke around the text (after creating another new Smart Object). And there we have it! That's how to quickly and easily add multiple strokes around text in Photoshop using Smart Objects! Check out our Text Effects or Photo Effects sections for more Photoshop effects tutorials!